The Blue Ridge Parkway runs from Waynesboro, Virginia in the north for 469 miles to the border of the Great Smoky Mountain National Park near Cherokee, North Carolina. Though it’s beautifully paved surface and sweeping lines will beckon you to turn up the gas, you have to be mindful as the speed limit is a mere 45mph. With beautiful mountain vistas, tranquil scenery and miles upon miles of meandering forest the Blue Ridge should be experienced at least once. 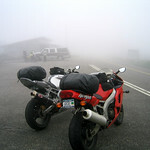 Unfortunately most of my experiences have been in the wet and fog. Thanks to Google Maps, you can use street view to get a look at the entire length of the Parkway. This is great for viewing one of the most recognizable passages on the Parkway; the Linn Cove Viaduct at milepost 304. The federal police don’t have a very good sense of humor nor do they care if you’ve been riding motorcycles for 2,000 years and that you “know what you’re doing”. Mid-week excursions on the parkway may offer you smoother passage with fewer daytrippers in cages. There are few if any legal passing zones. If you don’t have GPS to tell you where the gas stations are, pick up a free parkway map pamphlet so you are aware of where you can get on or off. Some of the connecting roads to the parkway are a treat! 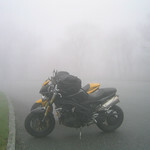 The roadway is subject to some serious fog! 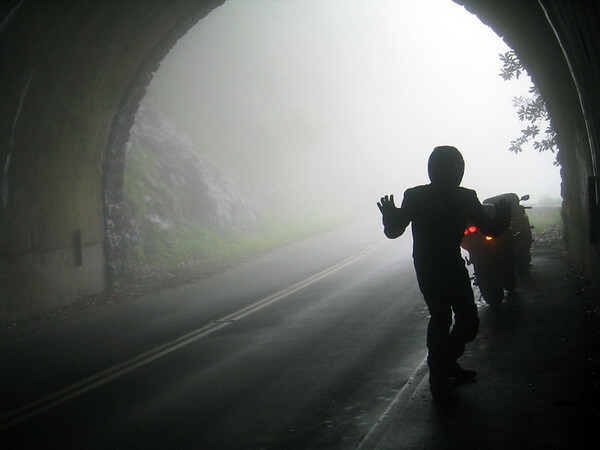 If your bike has hazard lights or flashers, ride with them on in the fog. Try to make yourself as visible as possible. Don’t hug the center line. You might not see oncoming traffic until they’re too close to do anything about it. 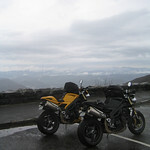 I am happy to say I have had great weather each time I have traveled the Blue Ridge. It has to be my favorite ride. I travel it when I am traveling to Ithaca, NY to Sarasota Fl. or returning to Sarasota from Ithaca. I find it to be one of the ultimate rides. You have a great site by the way. You’re right it s definitely a great ride. 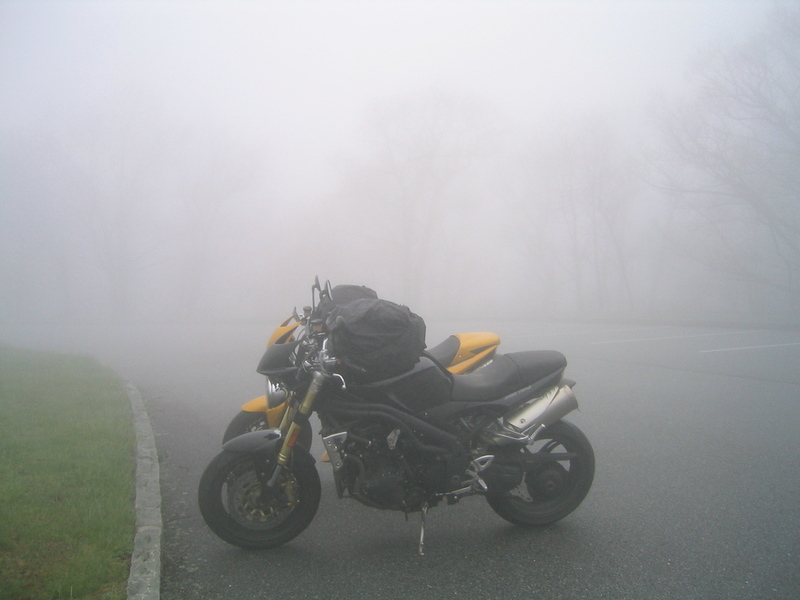 I’ve been able to travel big sections of it a few times without and fog. It was great to be able to just fall into the groove of rolling along, enjoying the scenery. Geez! Makes me wish I was there right now! MeToooooo!!!!!!!!!! 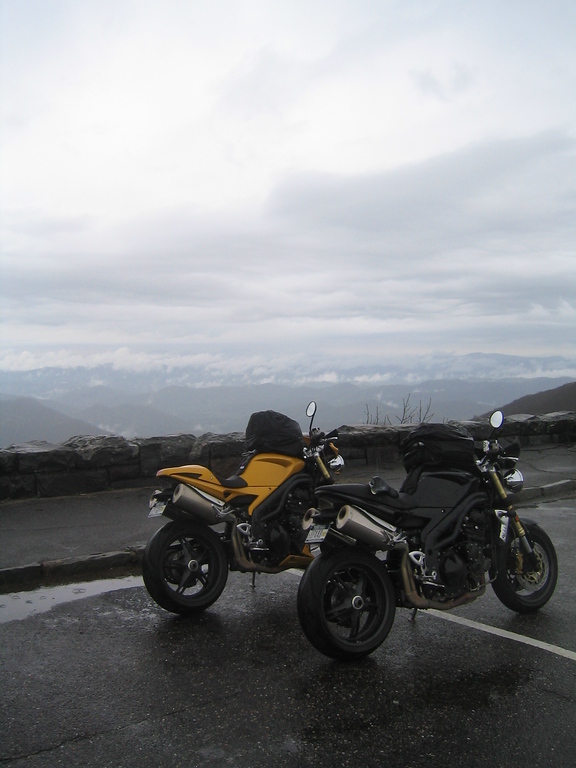 In fact I am planning a trip right now and will travel part of the Parkway during the ride up to NY but I am going to chose some alternate roads.If you have some suggestions I am open to all . 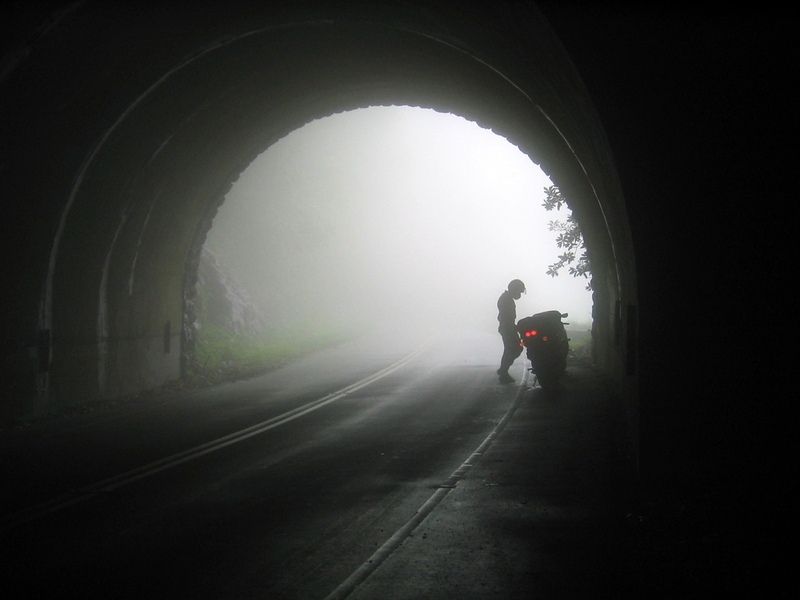 The Blue Ridge is beautiful but I have to say my ride was half fog, half drizzle and the rest of it pouring rain so hard I couldn’t see the centre line – Maybe one day I’ll see it in the sun. I think I’d love that, easier to spot the bears by the way. 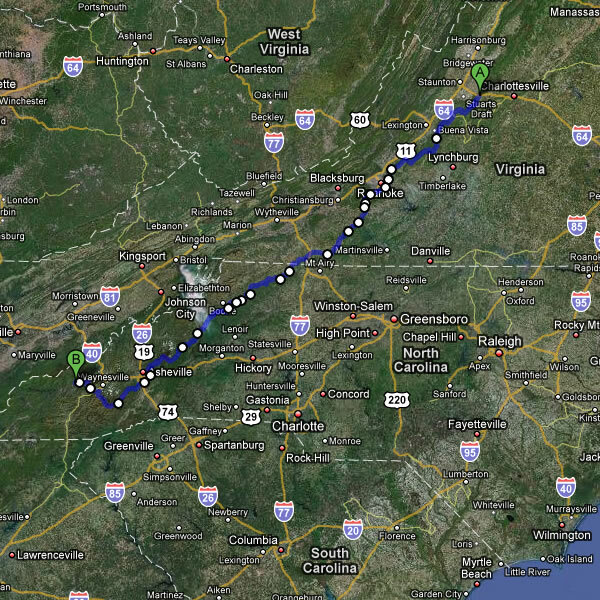 Our rides of the blue ridge have been such a mixed bag. 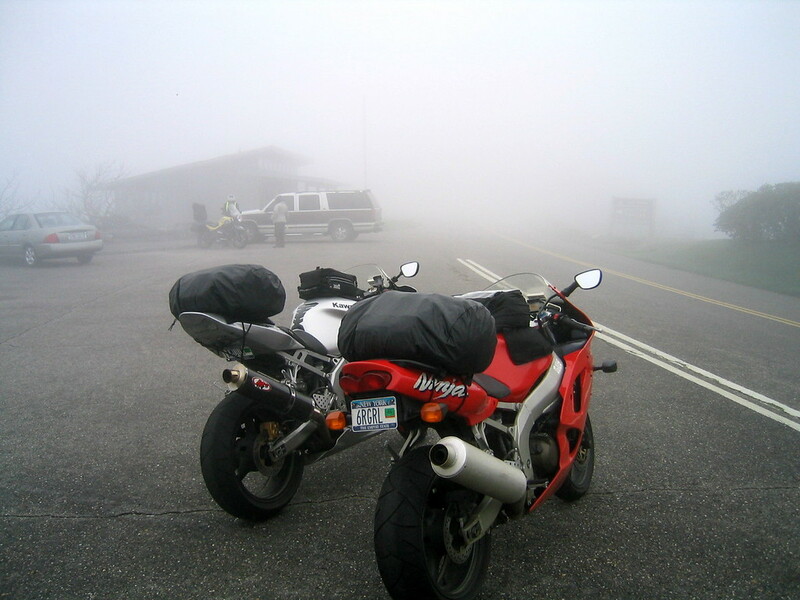 Some of the worst fog i have EVER ridden in and then other times… it is pure perfection. You’re spot-on about the connecting roads! Much more hilly, twisty, faster and fun!